Shakin & Bakin Foodie Blog: Product Review ~ Pomi Italian Tomato Products! 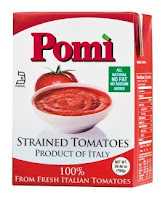 Product Review ~ Pomi Italian Tomato Products! Today I get to talk to all of you about a few great tomato products made by the Italian company called Pomi. I personally had never heard of this company or their products so when I was contact by them and asked if I wanted to review their Chopped Tomatoes and their Strained Tomatoes I jumped at the chance. Here is some information about the products (provided to me by the company): Canned tomatoes are synonymous with high sodium and chemicals. Packaged with preservatives, citric acid, toxic BPA and other additives, we all know canned tomatoes are not a good alternative to fresh tomatoes. The best way to “kick the can” and bring safe, healthy tomatoes to the table is to Pomì! Pomì is a brand of 100% all natural, BPA-free boxed tomatoes straight from Italy. It is packaged in a SIG Combibloc without preservatives, additives, water or citric acid and the tomatoes are never grown with pesticides or through the use of genetically modified seeds. Pomì is also rich in Lycopene, a powerful antioxidant which can help decrease a person’s risk for certain types of cancers, such as prostate and lung cancer. My Review: Once the 2 cartons of tomato products arrived, I decided to make my family a big pot of chili so that I could utilize both cartons at the same time. I was really impressed with the packaging because I try to avoid purchasing and using canned products and the Pomi tomato products are packaged in easy to use cartons. Stamped right on the carton it says they are All-Natural, No Fat and No Sodium added and I certainly appreciate that since we don't like consuming preservatives or un-needed salt. This is an imported product direct from Italy and we all know that Italians know their tomato products! No refrigeration is needed until after you open the carton and then you place any left-overs into the refrigerator where it will keep for up to 10 days. 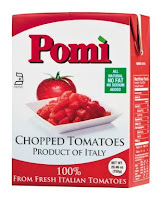 The Pomi Chopped Tomatoes have no preservatives, coloring agents or GMO's and this carton ONLY contains one ingredient...fresh sun ripened tomatoes that have been chopped into chunks and packed in the area of production to lock in their freshness. Wow! I love reading that it's only one ingredient!!! The Pomi Strained Tomatoes are made from 100% Italian fresh tomatoes and then strained and packed into the carton at the area of production. Again...only one ingredient...tomatoes! So...I got busy making a big pot of chili using my favorite chili recipe which I made in my slow cooker (crock pot) and after 3 hours our dinner was done. I simply replaced the tomato products that I normally use with the Pomi tomato products that I was sent for my review. I gave each member in my family a big bowl of chili and they dug in for dinner. One thing I noticed right away was the taste...our chili definitely tasted like I had used fresh tomatoes picked from my backyard garden! I loved that the sauce didn't taste sweet nor salt...had the perfect tomato taste to it. Once the dinner was done...my hubby commented to me the following. "Honey, I don't know what you did differently this time with the chili but it absolutely rocked!" Well...that tells me that just the simple replacement of tomato products made a huge difference in the recipe that I normally use to make chili! Yeah!!! Overall Impression: I absolutely love the Pomi Italian Tomato Products! I know when I head to the store I will be purchasing these products from now on! I love that there are no other ingredients in this product other than fresh Italian tomatoes! I love that the product is packaged in easy to use cartons that don't need refrigeration until after I open them. Once I purchase some Pomi Strained and Chopped Tomatoes, I am going to make a big pot of vegetable tomato soup next week and I am sure it will be just as delicious as our chili. I highly recommend that you check out Pomi for all of your tomato product needs! I give this product a HUGE 2 big thumbs up!